If your dryer is malfunctioning, it can put a serious damper on your ability to do laundry. 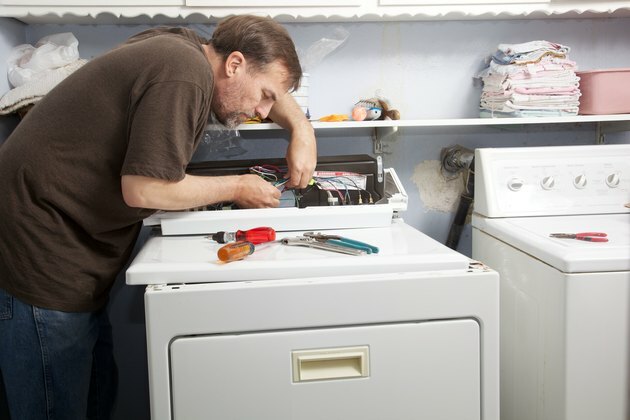 Fortunately, dryers are fairly simple machines, and many troubleshooting techniques can get to the heart of the problem without the need to spend a lot of time or money. One common dryer problem that's possible to diagnose and fix yourself is a broken or malfunctioning drive belt. The drive belt is a thin, circular piece inside the appliance that turns the dryer drum whenever the motor turns. Without this important part, the drum of the machine won't spin. The dryer would then just blow out hot air, but your clothes would sit in a heap at the bottom of the machine. The drive belt is a necessary part to make the drum spin, which is essential to proper and even drying. If the drive belt in your dryer is broken, the machine will still turn on. The door will open and close properly and all of the settings on the dial or electronic keypad should still function. Though the motor will run and release hot air, however, the dryer's drum won't move. If your dryer has been warming your clothes but they're not coming out dry, or if it seems to be working based on the noises you hear when you turn it on but your clothes are still wet after the cycle ends, the drive belt may be to blame. It's fairly simple to check whether the drive belt is broken. Removing the top and front of the machine while it's turned off, unplugged and disconnected from any natural gas source will allow you to inspect the belt. If it isn't all one circular piece surrounding the drum, you'll need to replace it with a new part. Before you undertake the repair of your dryer, be sure that it's turned off. Next, unplug it from its outlet. If you have a gas dryer, disconnect it from its supply line. These steps are essential to ensure your safety during the repair. If your dryer has a lint screen in its top surface panel, remove the screen. Then, use a Phillips-head screwdriver to remove the screws from the lint screen housing. Once this is done, you should be able to raise the top panel of the dryer. It may help to use a putty knife or the edge of a thin screwdriver to wedge beneath the panel and pry it up. Ask a helper to hold the panel up as you continue your repairs or carefully prop it against the wall, if possible. Next, use a slot screwdriver to disconnect the locking tab on the wire harness plug for the door switch. Detach the wire harness. This should enable you access to the front panel of the dryer. You'll need to remove the front panel's mounting screws using a nut driver. Pull the front panel forward once these screws have been removed. You should then be able to lift and unhook it from its bottom hangers and set it to the side. Now, you should be able to see the drive belt. It will most likely be a thin black band stretched around the drum of the dryer. Since it's broken, you can remove the belt without removing the drum. Pull it out and dispose of the broken belt. Take a new drive belt and place it on the drum. You may need to lift the front of the drum so you can access the motor and pulley. You'll need to thread the drive belt through the idler pulley, which you should then move to the right. Next, loop the drive belt over the motor pulley. Now, reinstall the front panel, reconnect the door switch wire harness and replace the top panel. Be sure that you've securely refastened all of these parts. Plug the dryer back in and restore natural gas or power. Start the dryer with a few wet clothes to test the drive belt. If they come out dry, your repair was a success.